Degenerative Disc disease is a classification of spinal disc malfunction that effects the vertebral discs that separate spinal segments and act as a cushion or shock absorber in the spine. Maintaining healthy spinal discs is crucial to over all health of an individual. 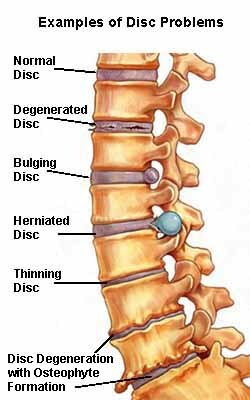 The disc of a well maintain height keeps pressure off spinal nerves as the body moves allowing signals from the brain to arrive at ending destination unencumbered as they where intended. This is what we strive to do at our Arlington Heights Chiropractic clinic. The spinal disc can degenerate over time when the spine is malpositioned. This “subluxation” causes aberrant motion at the disc space thus wearing down the disc. This can include in DDD, protrusion, spondylosis, and/or subluxation of vertebrae (spondylolisthesis) or spinal stenosis. More serious pathological issues may also cause such symptoms such as diffuse idiopathic skeletal hyperostosis (DISH), ankylosing spondylitis , infection or a myriad of auto immune diseases. A comprehensive and through physical examination is required for proper diagnosis. Chronic low back pain sometimes radiates to the hips, buttocks, thighs legs, feet. Symptoms may be exacerbated by sitting, bending, lifting, and twisting, computer work, driving, physical activity, inactivity or stress. Chronic neck pain can also originate from DDD, radiating to the head, shoulders, arms and hands. Open the joint space. This is achieved by chiropractic adjustments. For bulging, herniated discs the flexion/distraction of the joint creates a negative vacuum retracting the disc back within the joint capsule thus relieving the pressure on the spinal nerve and removing pain and disfunction. For thinning or degeneration without fusion the same applies. Keep the joint moving and create as much space as possible. An X-ray of the area will determine the extent of the degeneration and dictate the chiropractic protocol best suited for the individuals rehabilitation. Water, proper diet, exercise, and stretching such as yoga are also incorporated for the best long term results. Dr. O’Hara will explain this after a through exam. A specific plan of action, patient education of their condition and time frame are all part of Dr. O’Hara’s protocol so the guess work and “we will see” approach is removed.